Recently completed, new construction, 2018 home located in desirable South Gulf Cove on county water and public sewer. This brand new home is located in a very well maintained, quiet neighborhood featuring an airy open floor plan great for family or entertaining with over 2100sqft of living space and an oversized 3 car garage. 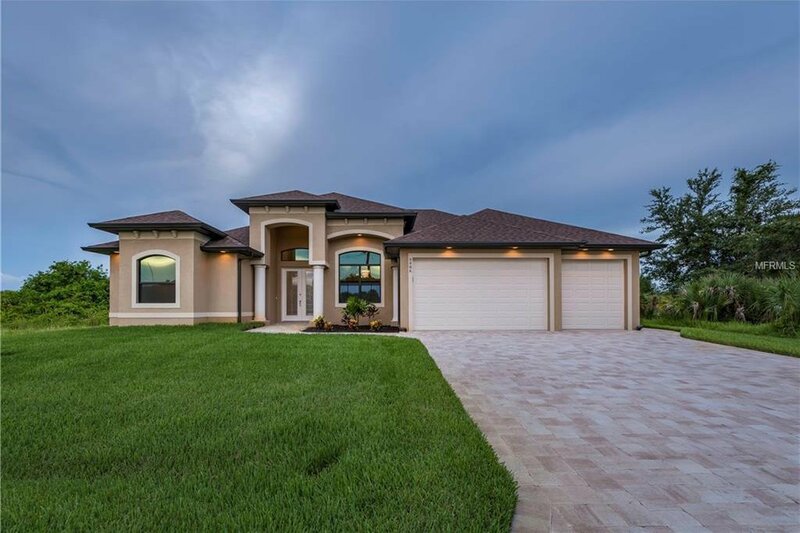 Home features include volume ceilings, decorative coffers, crown molding, gourmet kitchen with granite counter-tops, stone backsplash, soft close wood cabinetry, stainless appliances, and lots of storage. Enjoy the custom look of diagonal set tile, and 90 degree sliding glass doors leading out to the expansive covered lanai. Relax will a cold beverage floating in the heated pool/spa year round featuring multi-color lighting, and an upgraded pebble tec finish. An outdoor kitchen could be easily added. Other key features include impact windows/sliders, brick paver patio/drive, well fed irrigation system, and energy efficient insulation throughout. Take a short car or boat ride to the Gulf Beaches of Boca Grande, Englewood, or Manasota Key to name a few where you will find world class fishing and sand between your toes. Other area amenities include, golfing, fine dining, and the Charlotte Sports Park welcoming the Tampa Bay Rays and the Charlotte Stone Crabs. Fly direct into Southwest FL International Airport and Punta Gorda Regional Airport offering a wide variety of destinations. Listing courtesy of KW PEACE RIVER PARTNERS. Selling Office: RE/MAX ANCHOR OF MARINA PARK.